Korean Myth of "Dan-Gun(단군), First King of Korea"
Every society has got it's own unique myths based on oral traditions.Here is a myth on how Korea(한국) came into being.This myth is almost familiar to every Korean,old and young. There was once a Heavenly Prince(환웅) who asked his father, the Heavenly King(황인), to give him the beautiful peninsula of Korea to govern. The King granted his wish and he went down to Korea with three Heavenly seals and 3000 followers. He landed in Korea under a now sacred sandalwood tree. Here he established a sacred city with three ministers to carry out his orders.These ministers were in charge of about three hundred and sixty officials who controlled things like grain, life, sickness and the determination of good and evil. A bear and a tiger who shared a cave near the sacred sandalwood tree wanted very much to become human beings. Everyday they prayed so earnestly before the tree that the Heavenly Prince decided to give them a chance to become human. The Heavenly Prince gave the bear and the tiger a bundle of mugwort and twenty bulbs of garlic and told them that if they ate only these and stayed in the cave for one hundred days that they would become human. So the bear and the tiger took the garlic(마늘) and the mugwort(쑥) and went into the cave. After a short time the tiger ran away because it could not stand the long days of sitting the cave and eating only garlic and mugwort, but the bear endured the boredom and the hunger, and after only twenty one days the bear was transformed into a beautiful woman. The woman was overjoyed, visiting the sandalwood tree again and again she prayed that she may have a child. She became Queen(웅) before long and soon gave birth to Dan-Gun the Sandalwood King. Dan-Gun later reigned as the first human King of Korea. When he became King he moved the capital to pyongyang and named the country Joeson (Choson), Land of Morning Calm. Later he moved the capital to Mt. Asadal(Mt. Guwol in Huang-He province) where there is now a shrine called Samsong (the Shrine of the Three Saints) dedicated to the Heavenly King, the Heavenly Prince and Don-Gun. It is said that when Dan-Gun abdicated his throne to the next king that he became a San-sin (Mountain God). 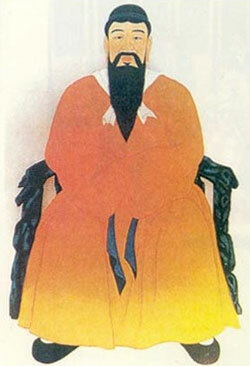 Since than Korean peninsula was ruled by various Kings and final dynasty which ruled Korea was the Joseon(조선) dynasty.